(1) Guess a starting location for the search; it doesn't need to be accurate at all (we usually use the time of first energy arriving at the first station as a guess). (2) Given our model of wave propagation speeds, and our initial guess of the earthquake location, forecast the expected seismic wave arrival times at each of the stations recording the earthquake. (3) Compare the differences between expected and observed arrival times, and use the differences to adjust the location (make a better-educated guess!). (4) Do step (2) again, but this time using the adjusted guess from step (3). (5) Continue doing steps 2-4 until the differences between successive location estimates is stable and smaller than some predetermined threshold. The computer performs the necessary arithmetic within a few seconds. For a more thorough discussion of this process see mathematics of earthquake location (despite the title, there are no equations in this reference). 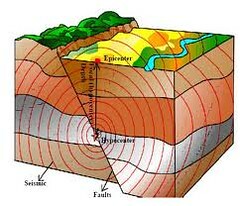 An earthquake location consists of 4 pieces of information, its latitude, longitude, depth, and origin time. So we need at least 4 seismic wave arrival times to estimate these four parameters. (1) Model dependence. The answer we get is only as good as the model we use of wave speeds in the region, and this is imperfect. In fact, when you think about it, the only way we know about the wave speeds in the region is by using earthquake seismic waves--Hmmm! that sounds like circular reasoning, eh? Yes it is. The good news is the more data we get, the more refined and detailed (and hopefully more accurate!) our model becomes. (2) Sometimes it fails. Occasionally the adjustment process fails. The revised location jumps between two (or more) possible spots and can't converge any closer, nor decide between the two, or the location gets "wedged" against a velocity boundary in the model and can't jump across it. In these cases the computer essentially shrugs its shoulders and alerts a human. We are really good at finding a problem (like a bad arrival time) or thinking our way out of the box to a better answer. Ultimately, all of our locations are reviewed by humans. (3) Large earthquakes are not points. All earthquakes on along a fault plane. The location that we compute and report for an earthquake is the focus or hypocenter of the event. The initiation point of the earthquake rupture. The recent earthquakes map shows the epicenter or point on the surface directly above the hypocenter. A large earthquake rupture may be many kilometers in extent. The 2002 Mw 7.9 Denali Earthquake ruptured parts of three connected faults for over a total of 330 kilometers. (4) Better scores don't necessarily mean better locations. The computer program judges the quality of a location by the average difference between expected and observed arrival times (on our event pages we call this the "rms" and it is measured in seconds). Theoretically, a small earthquake may just use 4 seismic wave arrival times, and will find the location with 0 rms! Perfect! The problem is that any uncertainty in the selected arrival time due to noise or other interference, and any imperfections in the mathematical model of wave propagation, lead directly to errors in location. On the other hand, more observed arrivals will inevitably lead to higher rms values--lower precision location. However, although the precision is lower, we are more certain that the location is accurate--the earthquake was where the model is telling us. Therefore, our locations come with numerous "quality factors" that quantify this tradeoff for each earthquake. (5) Location! Location! Location! Even lots of arrival times are insufficient to obtain a really high-quality location if the geometry of the recording stations around an earthquake isn't right. The best locations are from earthquakes where the stations: (a) have at least one station close to the earthquake (no farther than the earthquake is deep is the rule of thumb), and (b) surround the earthquake. Therefore our locations are generally poorer on the edges of our network--especially offshore, and in the eastern and southwestern parts where stations are few and far between.